WATERVILLE -- A parade of sparkling lights and the opening of Santa's downtown mini-village Friday night will kick off the city's annual holiday season. WATERVILLE — A parade of sparkling lights and the opening of Santa’s downtown mini-village Friday night will kick off the city’s annual holiday season. “We hope that everyone comes down and enjoys it and brings their friends and loved ones from out of town,” said Jennifer Olsen, executive director of Waterville Main Street, which organizes the event. 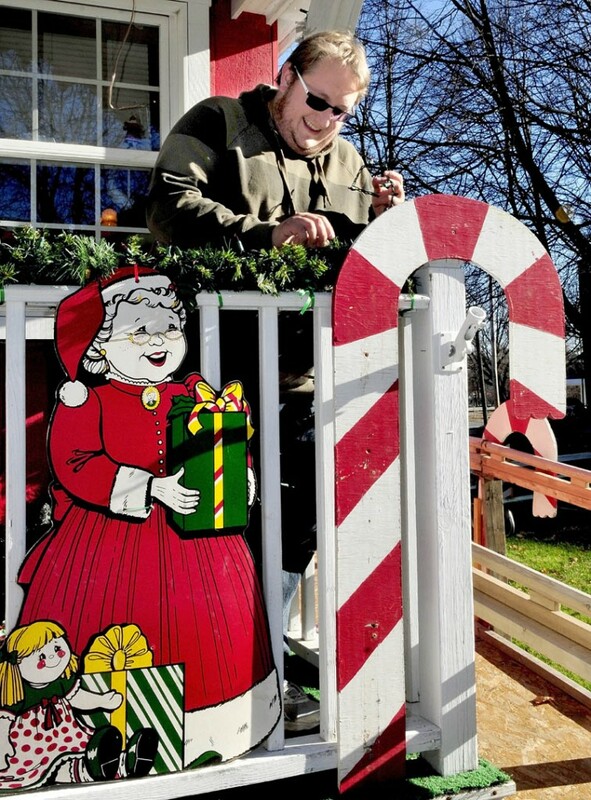 Alex Small, coordinator for the Parade of Lights, decorates Kringleville in Waterville on Sunday. The annual holiday season kickoff parade event is this Friday at 6 p.m., beginning at the American Legion and heading toward downtown Waterville. The parade will start at 6 p.m. in a new location this year: the American Legion Hall on College Avenue. It will proceed south on Main Street, drop Santa and Mrs. Claus off at Castonguay Square and continue south to Spring Street Extension, according to Olsen. About 25 floats will be in the parade, she said. “The public safety folks (police and fire) will definitely be there, some old favorites of family floats, scouts, dancers, lots of lights,” Olsen said. Santa and Mrs. Claus will enter their cottage at Kringleville in Castonguay Square next to City Hall. Children may visit with them and tell Santa what they want for Christmas. “He does have a little surprise for them,” Olsen said. To ensure better safety, organizers will designate part of The Concourse for handicapped use during the parade, she said. People who have mobility difficulties may park in the northeast area of The Concourse where the farmers market is held on Thursdays. In the past, people have parked along Main Street, which has posed a safety issue, she said. KFS bank on Main Street this year will open its back doors to The Concourse so that people who park there may pass through the bank lobby to Main Street to view the parade. Bank employees will hand out candy canes and cocoa packets in the lobby and outside the bank on Main Street. Mrs. Claus’ workshop will open before the parade at 4:30 p.m. in the REM room at The Center, Olsen said. At Kringleville, Santa will direct the lighting of the giant evergreen tree after the parade, and Oldies River 93.5 and Mix 107.9 will broadcast live. Central Maine Photography owner Mark Huard and his staff will take instant photos of children with Santa Friday night and throughout the Kringleville season. The photos cost $6 each, with part of the proceeds going to local charities. About 5,000 photos were taken last year, Huard said Sunday. He said his staff on Friday also will sell LED candy cane lights and necklaces that flash many different colors. If the weather is bad Friday, the parade and Kringleville opening will be Sunday instead. A message to that effect will be on Waterville Main Street’s phone at 680-2055. Olsen said people are encouraged to shop locally during the holiday season. An annual open house Dec. 8 will feature local retailers hosting special events. Waterville Main Street will host carriage rides to encourage people to shop locally.